The days of diesel engines being sluggish and unresponsive are long gone. Highly economical, extremely torquey and now capable of top-notch performance, choosing a diesel is no longer a cause of embarrassment for car lovers. One way in which diesel engines can suffer, though, is from the build-up of deposits in the engine. Today, we’ll walk you through one solution in the form of the 6 best diesel injector cleaners. Why Use Diesel Injector Cleaners? What Do These Fuel Additives Do? Do Fuel Injector Cleaners Actually Work? How Often Should You Use a Diesel Injector Cleaner? Are All Diesel Injector Cleaners The Same? Can a Good Fuel Additive Really Boost Performance? 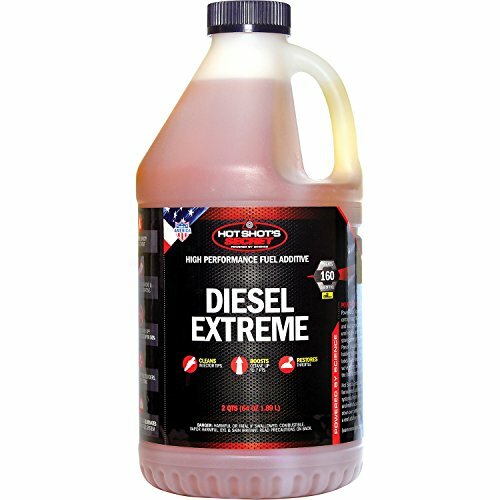 Hot Shot's Secret Diesel Extreme Clean & Boost 2 Qt. One of the key selling points of this enduringly popular diesel injector cleaner is the way in which is gets shot of water from the fuel. Working to stabilize and to lubricate not just clean away deposits, this is an all-purpose cleaning solution well worth your further investigation. If you’ve got an older car and your fuel system is starting to labor, investing in some Hot Shot’s Diesel Extreme can help with performance and economy while also getting shot of those unsavory accumulations in the engine. As well as giving cetane a boost, this fuel additive also acts as a stabilizing agent. Although there are stronger options when it comes to preventive action, this solution nevertheless helps to coat your fuel tank and serves to stave off corrosion. The added kicker with Diesel Extreme is the highly efficient way in which it removes water from the fuel making it perfect in countries where this is more of an issue. While Royal Purple is perhaps not the most widely-known brand, they deliver a no-nonsense and comprehensive fuel additive at a price you’ll love. Great for working over your whole engine rather than being limited to the fuel system, Max-Tane works a treat on diesel and bio-diesel. 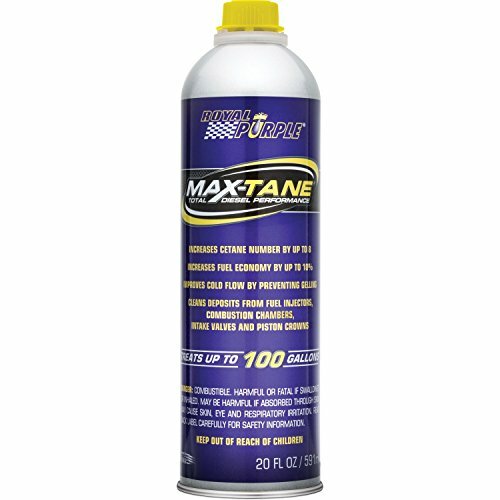 If you’re looking for the best diesel injector cleaner that works its way around your whole engine rather than simply the fuel system, Royal Purple Max-Tane is the obvious choice. This additive is functional in a number of key areas. You’ll experience less smoke and smell coming from your vehicle as the deposits are cleaned away. Resultantly, fuel economy will get a welcome leg-up. From the valves and pistons through to the combustion chamber, everything gets nicely blitzed and lubricated so you could experience minor performance gains into the bargain. For a cost-effective and wide-reaching diesel injector cleaner, Royal Purple punches above its weight. Specifically designed to scythe away those menacing deposits left behind by diesel, Liqui Moly is a hard-hitting diesel injector cleaner at a pocket-friendly price. If you keep your car in tip-top shape, this is not the ideal product. If, on the other hand, your older car needs a helping hand, give this fuel additive a try. It’s crucial to choose the right diesel injector cleaner for your car. If you have an aging vehicle and you don’t maintain it as frequently as you should do, Liqui Moly is tailor-made. You might even end up fighting back against stubborn engine problems. The key focus of this additive is removing accumulated sediment. It does this job and does it very effectively. As well as reducing emissions, you’ll get less annoying engine noise and possibly a small enhancement on the performance front. A single bottle will clean a whole tank of fuel and you’ll see off all those nasty resins that can bog your engine down. 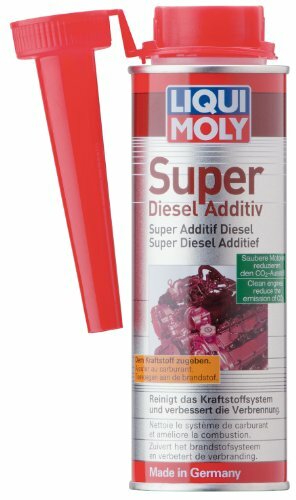 For an affordable and useful method of combating the rigors of an older diesel engine, Liqui Moly is well worth a place on your shortlist of the best diesel injector cleaners. 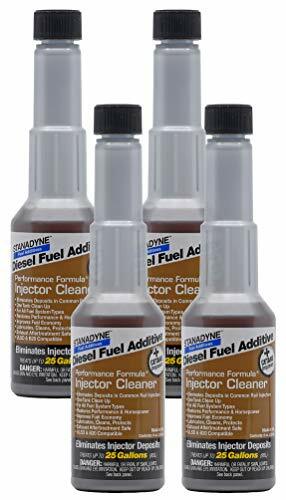 You’ll get 4 bottles of diesel injector cleaner at a reasonable price point with Stanadyne Performance. Made by the company behind fuel injectors, you know you’re in safe hands here. The single-tank feature means you can clean everything with a single application rather than constantly needing to top up. Stanadyne manufacture fuel injectors so, as you can imagine, their cleaning fluid is among the best on the market and one you can absolutely rely on. You’ll get a pack of 4 bottles and the recommendation is to use a single bottle every 2 or 3 months. If you don’t like the idea of a cleaning system where you need to continually administer little doses, this solution makes perfect sense. This additive lubricates the engine and consequently adds to its lifespan. You’ll see a drop in nasty emissions and your engine should run more quietly. Fuel consumption should drop at the same time that performance gets an upswing. For a no-nonsense fuel additive that works a treat, look no further than Stanadyne. An ever-present entry on any list of the best diesel injector cleaners, Power Service’s Diesel Kleen is not the cheapest additive but buying cheap is seldom a wise bet when you’re dealing with your car. For all types of fuel including biodiesel, this is another cleaner that works better with older vehicles. 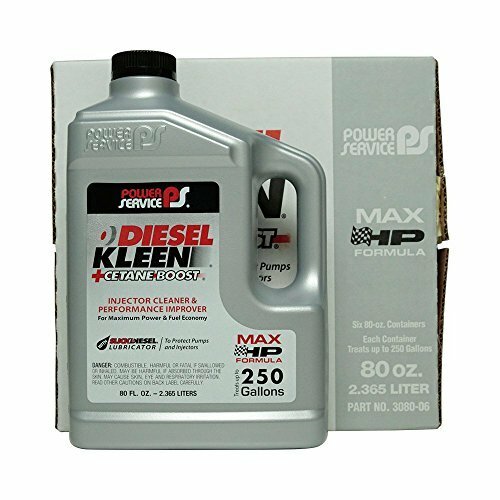 Diesel Kleen from Power Service is another diesel injector cleaner that delivers for all types of diesel but comes full into its own with older cars. Fuel economy can be improved by a staggering 8% giving you a great return on investment. You’ll 6 bottles (80oz) so, although the bottom line is not cheap, this package represents great overall value. You can protect your fuel system and eke out more service from your engine at the same time as watching noise lessen and far less emissions spewing out from behind. Even if you use biodiesel or have a high-pressure fuel system in place, Diesel Kleen steps in to perform strongly across the board. Although Lucas Fuel Treatment comes in at a highly competitive price point, you won’t get stiffed in terms of results for hunting down a bargain. Capable of treating up to 400 gallons of fuel, you dip out slightly when it comes to overall performance but this additive still does a rock-solid job. 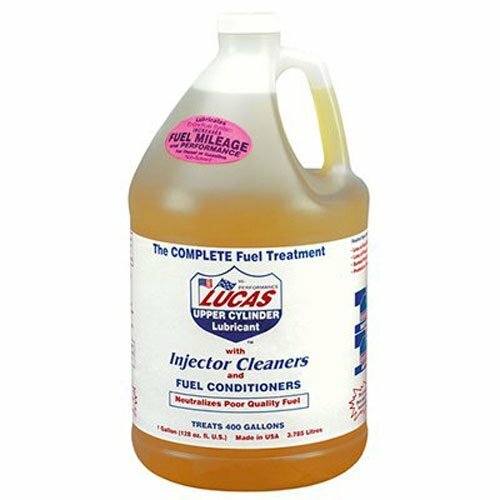 Last but by no means least in our look at the most effective diesel injector cleaners on the market is a real bargain from Lucas. You’ll get a 1-gallon bottle at a very reasonable price and this is good to deal with an extremely generous 400 gallons of fuel. This additive treats the fuel system while also helping to prolong the lifespan of both your fuel pumps and injectors. The solution also works its way into the combustion chamber, pistons and valves making it a complete answer to cleaning up your engine at a budget price. You’ll get less noise, fewer stinky emissions, improved fuel economy and at the same time your engine components will be protected against future damage. As with many diesel injector cleaners, this additive is a particular winner if your vehicle is advancing in years. Even if you drive the older type without the more modern style of fuel injectors, you’ll get plenty of value from this extremely cost-effective attack against dirt and grime in your diesel engine. There’s always heated debate over whether fuel additives are a necessary evil or can do more harm than good. We have to say that a great deal of negative opinion comes from owners of car shops who have a vested interest in you opting for a recalibration of the injection pump or replacement nozzles instead. Diesel is a particularly dirty fuel. While it offers you many benefits, the carbon deposits and soot left behind can easily clog up your engine impairing performance and causing nasty emissions. Beyond this, an engine bogged down with these deposits will return worse fuel economy thereby negating one of the main reasons for buying a diesel vehicle. So, by using a diesel injector cleaner as part of your maintenance routine, you can help to eliminate this problem without spending a fortune on mechanical bills. Diesel injector cleaners are detergent additives that will enhance the quality of the fuel you use while also improving the combustion chamber. As well as giving the injectors themselves a thorough cleaning, these additives also buff up the pistons, carburetor and other key components for a tune-up ride. By cutting through the accumulated deposits, fuel injector cleaners can help to uprate the way your diesel car drives, cut down on smoke belching out the back while also optimizing fuel economy. Although opinion is polarized on whether or not this approach is the best method, few would claim that fuel injector cleaners don’t effectively solve the problems caused by diesel engines. The difference is more easily noted in older diesel cars than with something new and up to scratch. This is perfectly understandable. With the more effective cleaners, you can experience an improvement of 2-3% in your fuel economy which can add up to quite a difference over the course of the year. Not only can these injector cleaners help to remove those niggling deposits, they also protect the fuel system and safeguard against future build-up. As a final bonus, proper diesel injector cleaners can even extend the lifespan of the engine. These additives take effect while you are driving and the frequency of use depends on mileage rather than time. Follow the instructions to see exactly how much of the cleaner you need to pop in. As a rule of thumb, you should add some more cleaner after 5000 miles. While the majority of these additives are marketed in the same way, not all of them work as advertised so it certainly pays to do your due diligence. If you take a chance on an additive then start to find problems starting your car, a worsening in fuel emission or any kind of corrosion, discontinue use. It certainly can but good is the operative word. If you choose your diesel injector cleaner wisely and make sure it’s the most effective additive for your particular car, you can definitely notice an upswing in performance. Along with enhanced combustion and more ease when you’re starting your engine from cold, you could enjoy a small but noticeable boost on the power front. We hope you’re equipped with a little more information about diesel injector cleaners and you can now decide whether or not to give these additives a shot in your ride. Think closely about the type of car you have and study the strengths and weaknesses of each of these diesel injector cleaners. With the minimum of effort, you can choose the best for your particular vehicle. Don’t hesitate to get in touch if you’ve got any questions at all. We’re more than happy to help in any way we can.